This is a family event and will be held every Friday throughout the summer starting at 7:00 pm on the Mountain Home Square. Bring your lawn chairs. 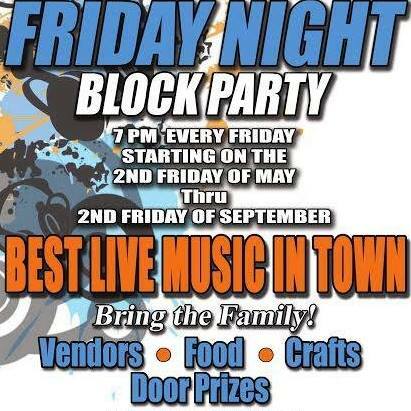 Located on the picturesque town square of Mountain Home, Friday Night Block Party is Arkansas's only Friday night free concert series that shows all kinds of genres. Live Music...Yard Games...Delicious Food and Great Raffles and Prizes provided by many of our local businesses. Contact Ron Shire at 870-404-6347 for more info.